So, lets start an Idea Thread for characters that way we can spread those creative juices. So I'm reading through the Hungers and I get to the Hunger for Punishment and my brain suddenly clicks, "That explains the DMV! No wonder people who have DUI's and Suspensions tend to file the wrong paperwork, they are given it 'on accident' by Hag-Beasts who feed their Hunger for Punishment by sending them chasing their tails through paperwork for months!" Dear god, those hags could spend Satity like it was going out of style, that would be the best feeding ground ever. And any hero's who attack get overwhelmed by the coven of Hag-Beasts with the massive home advantage. You also have Mafia Contacts who do you favors and in return you patch up their boys when they end up hurt, and if you tell them that a tooth needs to come out, well your the doc right? I was watching American History X at the team of the reading so my mind when to an odd place to feed, dominating on the basketball court. "I got a bet. I come in this game right now, same score. We play black guys against the white guys. No money, for these courts. And not just today, for good...." Be a giant who shuts out the best on the street. I have a Dragon Tyrant who I expect casual observers would confuse for a Predator, because the manifestation of her Hunger for Power is being acknowledged as The Ultimate Apex Predator. Think about it. What is a Western Style Dragon, when you break it up into it's component parts? The Body of a cat. The long neck and tail of a serpent(dragonfire could also be an exaggeration of venom-especially from a spitting snake), the wings and talons of a raptor, wrapped in the hide of a crocodilian and with teeth to match. It's a combination of all four of the predators of early man. - A professional dominant Anakim Tyrant specialized in the public humiliation of his clients. His scenes are always spectacular, and often cathartic as he teaches his submissives their true place at his feet. -A vigilante Eshmaki Nemesis working at a women's shelter. She makes sure that abusive partners are punished for their actions, again and again. She never kills them, not even when they beg her to. -An Ugallu Ravager working as an inestigative journalist. She likes destroying the image and standing of the rich and powerful by exposing to the world their failings and corruption. She doesn't care about the repercussions, she only wants to tear off the masks and show the true, ugly faces of the so-called elite. -A Makara Collector who works as a talent scout for a modeling agency. He has a very good eye for new talents and a silver tongue. Once he has his sights on someone it is only a matter of time before he sign them up. It's a harsh business though, and models leave all the time, submerged by the demands of the job, or lured away by the competition. It's all right though, it just means he has to find more. I've got afew Ideas, one of which i posted in the main Beast thread, so won't repost it here (Might do later). I've seen afew i can use as examples, but I've thought of one that I need too use sometime, possibly as antagonists for a group. - The Gang: A group of Criminals and a Brood of Begotten that is lead by a Eshmaki Collector, who arranges for the cops too be tipped off on the fact that they are operating in the City, but never where and when just that they are and will be stealing things for the next week/month/year. The rest of the Gang feeds on different things, atleast one of them feeds on the paranoia that they create in the populace and Police. Especially when they Tear the doors off of Bank vaults and safety deposit boxes, or get up after being shot in the chest 2-3 times. Will put more when i think of them. Edit: ....... I Just realised you can Use Beast too make a Predator and a Xenomorph....Now... anyone for Alien Vs Predator? Last edited by RickmanUK; 06-09-2015, 05:38 PM. An Eshmaki Tyrant pop/rock singer that uses their Nightmares to sabotage others careers and propel themselves to the top of the charts by manipulating the Temenos. They're able to feed equally on the crushed dreams of their rivals and the adoration of their fans as both reinforce their position of dominance. Last edited by proindrakenzol; 06-09-2015, 05:32 PM. It makes me think of the Misfits from Jem and te Holograms. I've been considering Atavisms for a Beast based off Silent Hill, possibly using Pyramid Head or Alessa. The two Nightmares I'd go with for chargen would be You Deserve This and You Can't Wake Up. Last edited by wander; 06-09-2015, 06:28 PM. I'd go with Makara for this, both because the Family has the best sort of mythic resonance(both in darker mermaid myths and in the popular misconception of the Sirens) and because doing so would allow you to start with both Siren's Treacherous Song and Alien Allure rather than picking between the two. The high school swim team is coached by a Makara Predator; a hydra to be exact! Normal practice goes just fine, but when its time to compete against other teams, the coach 'cheats' to win. They harness their power over Nightmares to fill their swimmers with the sense of being chased, a carnivorous predator swimming after them. He doesn't go all out and make them suffer hallucinations, but he does give them enough of a scare to pump them full of adrenaline, making them swim faster and harder than the opponents. Of course if that doesn't work, he can also fill the enemy team with a stronger version, making it difficult for them to hold their breath and concentrate on their lane! I'm working on an Anakim Tyrant who's a surgeon, and embodies the hopelessness of sickness while feeding off the power her job gives her over the lives of her patients. I also want to make a Namtaru made of bees who actually owns several hives of bees and makes a living off selling their all organic honey. I'm thinking a Gaia's Revenge sort of Nemesis who leaves their victims at the local national park. I really just want to make a flower child who is made up of bees, okay? 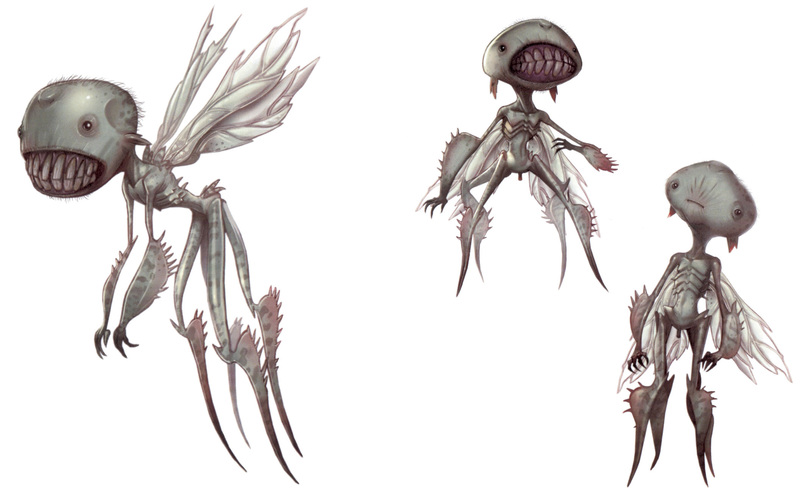 I've been gradually threading together an Ugallu Tyrant student teacher/TA for some time now; recent consideration has led to adjusting the Tutor's Soul to be decidedly spidery after a lot more faffing about with winged creatures despite lacking the MO to necessitate the appendages. There's also Tensai, the faceless Namtaru Ravager who's hanging around a ring of Saboteurs for the sake of Chamber-scrapbooking divine fallout. Making a Namtaru Collector who works in as a librarian whats surprising for his brood is that he doesn't collect books but games ranging from card games to videos games. A Mr.Grey styled Ravager, very likely an Ugallu, who enjoys feeding his Hunger very much on the assorted people he takes back to his 'special place'. He is not fussy on what gender he takes in, though he does Feed from destroying the limits his partners have and he enjoys breaking them whilst he gets gratification from them. He is an Ugallu rather than an Anakim as it's more about making his partners exposed and embarrassed than actually causing them harm or taking their power from them. Holds You Deserve This and You Must Obey as his Nightmares (of course).